*Please note: Previously named the Online Master’s in Innovation and Entrepreneurship (OMIE), the name of the program has been changed to MSc in Innovation and Entrepreneurship to accurately reflect what a graduate of the program will see on his/her diploma. 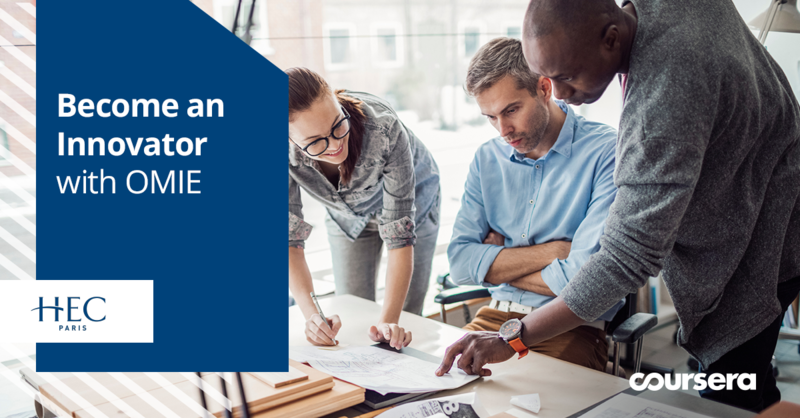 HEC Paris’ MSc in Innovation and Entrepreneurship (MSIE) is a self-paced 100% online degree that helps bring your ideas to life through a rigorous combination of academic theory and learning-by-doing activities. We spoke with two participants from the program about why they chose MSIE and what it’s like to be part of a global classroom on Coursera. Rahima is a project manager at General Electric, and her job requires her to be extremely organized and detail-oriented. She was looking for a master program that would help her become a more innovative business leader and decided that MSIE would be the perfect fit. Tim is a site manager for Colorite Compounds, a leading producer of polymers for medical and industrial use. He’s a self-starter who’s founded 5 companies during his career, but he felt he needed to learn more entrepreneurial skills that the MSIE provides. Take part in a global classroom and engage with peers from all over the world without leaving your city. For a preview of the degree program, check out these open courses now: Entrepreneurship Strategy: From Ideation to Exit and Organizing for Innovation. Apply for the MSc in Innovation and Entrepreneurship degree. Explore business degrees offered on Coursera.